Is it legitimate to demand of evolutionists an explanation for the origin of genetic information? 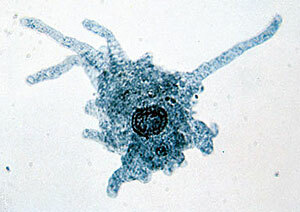 Some amoebae have a huge amount of DNA in each cell, much more than humans. Does that mean they are more biologically complex? Hardly. It just shows we have a lot to learn yet. The leading antichristian and eugenicist Clinton R. Dawkins is not without his defenders. One questions us on the issue of genetic information, a question Dawkins had immense difficulties with. Don Batten responds with instructive points about the latest discoveries about information and meta-information (information about information), as well as pointing out the confusion between amount of DNA and amount of information it holds. I would like to respond to the ‘Skeptics choke on frog’ article regarding, among others, Richard Dawkins. The idea that biological complexity equates to genetic complexity is completely wrong. Charging evolutionists to describe a mutation which would ‘add information’ to an organism’s genome is an irrelevant question. In fact, there ARE actually such mutations, which will increase the volume of a genome and even add genes (they are due to the activity of some viruses and of translocons, and to chromosomal recombination). However, the evolution of organisms from ‘simple’ to ‘complex’ has nothing to do with how many genes an organism has or how large its genome is. In science, we even have a name for the fact that the number of a species’ genes has no relation to the relative complexity of that organism: it is called the C value paradox. As an example, humans have approximately 20,000 to 25,000 genes. Rice has somewhere around 37,000 genes. If an organism’s evolutionary complexity actually had anything to do with how large its genome is, or even with how many protein-coding genes it contains, then rice would be the considered the paragon of evolutionary AND creationary mechanisms. The prime, chosen species on the planet created by God would be whichever species had the most genes. If humans were really created in God’s image as the ultimate species, with stewardship over all other species because of their closeness to God, and if the number of a species’ genes was directly related to their superiority, then humans would have the greatest genetic complexity. We do not, not by a long shot. Thanks for your query, which does afford us the opportunity to correct a misconception. You are correct: the complexity of an organism is not to be measured simply by counting the number of protein coding genes. Life is far more complex than that. I don’t think we have ever suggested that the status of an organism in God’s economy is to be measured by the number of such genes and that therefore humans would necessarily have the most. However, the evolution of a microbe into a complex organism such as rice or a human does require the addition of new genes. For example, the simplest single-celled organism has about 500 protein-coding genes and humans have over 20,000. So, if we began as microbes in some primordial soup, as evolutionary theory posits, then a lot of new genes had to be added by mutations—the only game in town for the evolutionist. There have to be a lot of mutations that add such new genes, not just twiddle with the existing ones. For example, the genes that make nerves and all the enzymes that enable nerves to operate are absent from microbes. They have to be created de novo if we evolved from them. There are many gene families in humans that are completely missing from microbes, so there has to be a viable mechanism for adding this genetic information if evolution is to be feasible. And mutations (accidental changes) of one form or other are the only mechanism for Darwinism. So the question to Richard Dawkins was a legitimate one. Indeed, Dawkins himself says that it is the information in living things that evolution has to explain. He candidly admits this in the rest of the interview that is included on the documentary. In The Blind Watchmaker Dawkins clearly outlines the ‘problem’ of information in living things. Of course, being a ‘true believer’ in evolution by necessity of his atheism, he has to believe that mutations and natural selection can do the job and he spends the rest of the book with various story-telling ploys to make a case for the adequacy of evolution to create the required information. Is rice more complex than a human because it has more protein-coding genes? It might be, because it is an autotroph, meaning that it is capable of creating all its own energy-rich biochemical building blocks using the energy from sunlight (in photosynthesis). In contrast, humans are heterotrophs, ultimately depending on plants to live (Genesis 1:29–30). We are incapable of making many of the complex biochemicals needed for life; we get them from plants. There are many genes involved in photosynthesis and the biosynthesis of the essential amino acids, for example, that we do not have (the origin of photosynthesis is another conundrum for evolutionists—see Shining light on the evolution of photosynthesis and Green power: God’s solar power plants amaze chemists). But we also have many genes that rice does not have: ones for making muscle fibres, nerves, hemoglobin, etc. So rice and humans are not really comparable; it’s like comparing apples with jellyfish. Comparison of rice with humans is a red herring. No one has proposed that humans evolved from rice, or vice versa. Evolutionists (such as Dawkins) readily admit that the evolution of humans (and rice) involved the addition of a lot of new genetic information to simpler organisms that supposedly made themselves in the beginning (another unanswerable problem for evolutionists—see Origin of Life Q&A). If someone wants to argue that all the information needed to make a human was there in the beginning, it just makes the origin of life even more immensely difficult to explain! But life is more than genes. The very concept of a gene as the basic unit of heredity that controls everything is being seriously questioned. The ENCODE project in particular has blown away the idea that life is just about protein-coding genes, although there were prior indications that this was incorrect (see No joy for junkies). In short, the rest of the DNA of humans and other complex organisms is not junk, but incredibly important. Basically, it controls how the genes work—for example, why it is that hemoglobin is only produced in red blood cells when all cells have the genes for hemoglobin protein. And it controls the incredible sequencing of genes so that orderly embryo development occurs. See also Meta-information: An impossible conundrum for evolution. So life is much more than genes. When we take into account the total DNA, rice has 466 million base pairs and humans have 3 billion (six times as much), which might be better for our egos than the comparison of the number of genes. However, even the number of base pairs, or the picograms of DNA per nucleus, is no adequate measure of genetic complexity. The smallest flowering plant genome is only about 0.1 picograms (flowering plant range 0.10–127.0 pg), whereas the largest alga is 19.6 picograms (algal range 0.01–19.6 pg).1 Clearly, flowering plants are much more complex than algae, so there is more to complexity than a simple comparison of genome sizes. Protozoa (for example amoebae) range from tiny to huge in their nuclear DNA amounts, some of them greatly exceeding the human number of base pairs.2 It is not really understood why this is so. It could have something to do with cell size, where organisms with large cells have a form of endoreduplication, where the DNA multiplies up to be able to provide enough mRNA transcripts to supply the large cell’s protein requirements. Specialized, enlarged plant cells do this (I have measured the relative amounts of DNA in the nuclei of such cells using microfluorimetry). Actual genome decoding does not suggest that protozoan genomes are large in terms of numbers of different genes, although at present the largest amoeba genomes have not been sequenced. Typical sequenced genomes of protozoans seem to be of the order of about 25 million base pairs.3 I expect that the large protozoan genomes, when they are sequenced, will reveal large-scale duplication of genes, such that that total number of different genes will be of the same order as other protozoans. In support of this, Amoeba dubia, the one with the largest reported amount of DNA, is the largest sized amoeba cell known, being visible to the naked eye—up to a millimetre in length. This compares with 0.009 mm diameter for a human red blood cell. Considering that the volume of a cell scales with greater than the square of the radius, the volume of Amoeba dubia cells is huge (~10,000x) compared to human cells. This almost certainly has something to do with the huge amount of DNA it contains. begs the question, which is, ‘What do you mean by biological complexity and what do you mean by genetic complexity?’ As we have seen, genetic complexity is far more than just counting the number of protein-coding genes. Much of it is only just beginning to be discovered. I think you meant to say ‘transposons’, not ‘translocons’, which are quite different (and a huge problem in themselves for evolution to explain, but that’s another story). Actually, movement of DNA with transposons or viruses does not create any new information; it only transfers it around, as we have explained before—this does not explain the origin of the genetic information. But there is now strong evidence that transposons are not ‘parasitic DNA’ or ‘endogenous retroviruses’ at all, willy-nilly shifting chunks of DNA around at random, but are involved in the regulation of gene activity during embryo development, for example (see the No joy for junkies article). Recombination during meiosis also does not create new information; it just selects from the existing alleles, giving different combinations in the offspring. Darwin made the mistake of thinking that variety in offspring meant new features arising spontaneously, whereas we now know, following the pioneering work of the famous creationist scientist, Gregor Mendel, that the variety is due to the recombination of existing genes, not the creation of new ones. See Genetics: no friend of evolution. If Darwin had known what we know about genes and mutations, he might not have become a Darwinist. Evolutionists also claim that genes can be duplicated and this is an increase in information. But if you write an essay of 5,000 words and it needs to be 10,000 words, you won’t get any credit for photocopying (duplicating) the 5,000 to get the 10,000. That’s what evolutionists are claiming when they say that virus transfer or duplication ‘increases information’. See also Does gene duplication provide the engine for evolution? The question to Professor Dawkins was quite legitimate, as he himself readily admits in his voluminous works. Evolution has to explain the origin of enormous quantities of information in living things (but it can’t). Royal Botanic Gardens, Kew: Plant DNA C-values database Return to text. Gregory, T.R. (2005). Animal Genome Size Database. http://www.genomesize.com Return to text. Wellcome Trust: Sanger Institute. www.sanger.ac.uk/Projects/Protozoa/ Return to text.